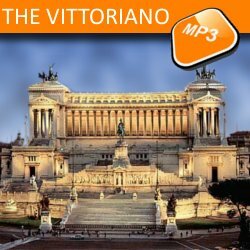 Description: Located between Venice square and the capitoline hill, the so called Vittoriano or Altare della Patria, is one of Rome's most controversial monument. Built as a tribute to the first King of a united Italy Victor Emmanuel II, the monument is made of white Brescian marble. Our tour will starts in Piazza Venezia, where we will admire the monument to Vittorio Emanuele II. We will then proceed towards the Roman Forum to enjoy the arches of Titus and Septimus Severus. We will continue towards the Aventine hill, to take a lovely picture in the porch of the Medieval church of St. Mary in Cosmedin, with your hand inside the scary Mouth of Truth.